A cost/benefit analysis posted at the German Skeptical Science site finds Ivanpah, the world's largest "solar" power plant, not only burns through a lot of birds, it inefficiently burns through a lot of fossil fuels and money as well. Ivanpah uses the ancient technology of firing steam boilers, which are far less efficient and generate higher emissions of CO2 & actual air pollutants than a modern gas turbine plant. Did anyone bother to run these numbers before this $2.2 billion taxpayer-loan-guaranteed boondoggle was built? As a way to replace fossil fuels with "natural" source, the solar thermal energy, is heated by concentrated sunlight in the water and the steam thus generated with generators produces electricity. It sounds clean and inexpensive at first glance.Finally, no CO2 emissions fall and the sun sends you know, if at all, only a very small bill. Right? 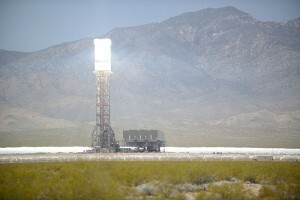 In California's Mojave Desert, about 50 kilometers south of Las Vegas , is the Ivanpah solar power plant. The commissioned in February this year, investment focused using mirrors sunlight on three solar towers, which is produced in this water vapor, are driven by steam turbines to generate electricity. With a rated capacity of 392 MW, the plant is the world's largest solar thermal power plant. However, this figure can not be compared with the rated power of conventional power plants, including the solar power plant can only produce electricity when the sun shines. And the production is following the path of the sun, at noon significantly higher than in the morning or evening. The annual production of the three generators is given as 1,080 GWh . This is equivalent to 2,800 full load hours, which is less than the value that an offshore wind power plant is usually attained. It can be seen therefore, quite clearly, economically it is not a solar power plant. But who is already considering the filthy lucre, when it comes to protecting the environment and to conserve fossil fuels. Where - the already relativized with the environment, when compared to the enormous land consumption of such a system with the conventional power plants. And you must not be pronounced bird friend . It has been found that is quite fast in operation that focuses sunlight to produce steam and is strong enough to grill birds in flight. And these seem to be attracted literally from the solar system, because the bright light of the mirror attracts insects. The birds fall with singed wings to the ground have to get on the staff of the facility nicknamed "Streamers". Because of the smoke plume, they strutting in the crash behind him. (Impressive images of burns, there are, among others here ). Estimates of the number of birds, characterized let their lives every year for the supposedly good thing widely. The operators go out of about 1,000 animals, Environmentalists fear up to 28,000. Otherwise come in so many dead birds per area or per megawatt hour at most wind farms in the immediate vicinity of SPAs. Also, the conservation of resources is not everything intact eco-world. If the sun does not even seem sufficient, in the Ivanpah power plant backup is provided, in which the lack of solar power is supplemented by the burning of natural gas.And so it looks like you have but a little overrated on the part of operators, the power of the sun. To compensate for this error has BrightSource Energy , the operating company, now applied for the California government to be allowed to use more natural gas for heating . This would imply additional CO2 emissions by 95,000 tons per year. Overall, 35 percent of the electricity would then not derived from solar energy, but from natural gas. Now if one takes into consideration nor that the efficiency of the system in low 28.7% is, therefore, less than half of a modern gas and steam power plant, it quickly becomes clear that this green flagship project in the desert in California especially is one, A resource and money-wasting green window dressing. The solar power plant has cost 2,018 million dollars . Adopted at a depreciation period of 20 years and 3% interest arising therefore capital costs of $ 135 million per year . Maintenance and operation hit with $ 67 per kilowatt of rated power and year to book, so makes further $ 26.3 million. Interesting is also a comparison of CO2 emissions , as to their reduction it is supposed to go above all. The "clean" solar power plant consumes 1.25 kWh gas per kWh of electricity. The combined cycle power plant requires 1.67 kWh of gas for the same amount of electricity. From this perspective, the "solar power plant merely an inefficient gas-fired power plant which is much more expensive with solar support. A kWh of gas produces about 200 g CO2 emissions. The one produced per GWh of electricity with the solar power plant thus covered 1.25 times 200 tonnes = 250 tonnes CO2. A combined cycle power plant emits the same amount of current 1.67 times 200, ie 334 tons of CO2. A GWh of electricity from the solar power plant will cost 186,000 dollars, from the combined cycle power plant 34,000 dollars. The cost difference of 152,000 at a CO2 saving of 84 tonnes of CO2 equivalent cost of 1,800 dollars per saved ton CO2. Has the good are 1360 euros, roughly as much as a ton of CO2 avoided by photovoltaics in 2004 in Germany at record high feed-in tariff of 54 cents per kWh cost.